The Winchester March took place on Saturday November 29th 2014. 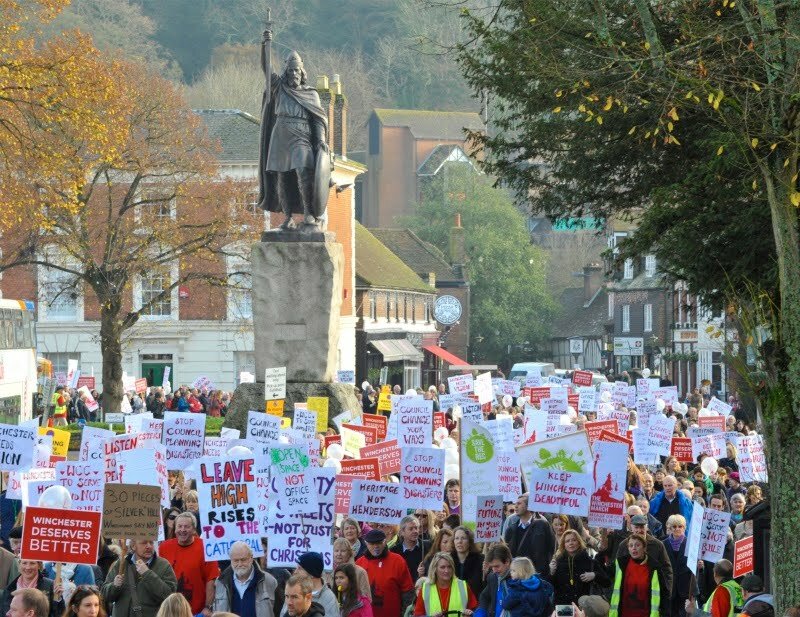 An estimated 2000 people marched from North Walls Recreation Ground to Winchester’s Guildhall in The Broadway, chanting and carrying placards and banners. The placards’ slogans urged the City Council to change its ways and listen to the people. Several disaffected campaign groups took part in The March, aggrieved by the Council’s poor consultation methods and its lack of transparency. There were also many individuals who, with similar concerns, took advantage of the opportunity to protest. Currently emotions are running high about various building developments across the city, most notably the Silver Hill city centre development, the Station Approach development (including the Cattle Market and Carfax) and the Chesil Street extra care housing scheme. The Silver Hill proposals are viewed by many as inappropriate and unsympathetic to its surroundings both in scale and design and what it will offer to the city. Spearheaded by the Winchester Deserves Better campaign group, many Winchester residents wished to voice their concerns particularly about the recent decision by the developers to exclude a central bus station and affordable housing from the scheme. The March protesters are not anti-development but are concerned that the regeneration of such a key city centre as Winchester must be appropriate in terms of its size, history and unique character and maximizing its appeal to residents and visitors alike. When the marchers arrived at The Guildhall, after live music and a flash mob event, they listened to three heartfelt speeches given by Winchester residents. The speeches reminded the crowd and the Council to consider very carefully Winchester’s heritage, environment and future governance. The crowd was told that if these were ignored Winchester’s future could be irrevocably damaged. The participants of The Winchester March will continue to exert pressure on the City Council to ensure that their battle cry “Winchester Wants Change” continues to be heard. If you would like to be kept up to date with news and further planned action, please provide us with your contact details via this website. Thank you.